We undertake turnkey contract for bulk installation of LPG bottling plants for filling lpg cylinders. These are sophiticated plants with or without carousel. We also provide special instrumentation for complete automation to enable faster and accurate cylinder filling. 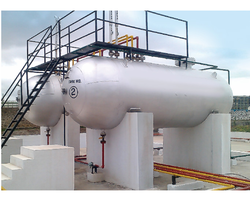 We are an eminent name occupied in offering premium assortment of LPG Bottling Plant for Gas Industry to our clients. Additionally, client can get the offered products from us at very affordable prices. Feasibility study on biogas bottling: A model has been developed for biogas bottling system in a village having a 60 m day capacity biogas plant. The system has two components A Removal of CO by water scrubbing B Compression of purified biogas in cylinders. Capacity: upto 3000 cyl per day. DESIGN CODE: ASME/PD 5500 etc. 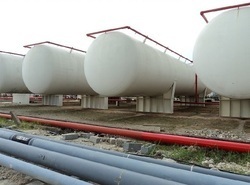 Being a highly effective and fast-moving firm, we are instrumental in providing LPG Storage Plant. Manufacturer & Exporter of LPG Bottling Plants. Our product range also comprises of LPG Lot Manifold System, LPG Reticulated System and Fixed And Portable Gas Leak Detection System. Leveraging on our vast industry experience and cutting edge facilities, we have been able to manufacture and supply quality assured range of LPG Bottling Plants. We undertake turnkey contract for installation of LPG Bottling plants for filling LPG cylinders. These are sophisticated plants with of without carousel. we also provide special instrumentation for complete automation to enable faster and accurate cylinder filling. Aditya Fuels Ltd works with own brand name “Aditya Gas. At present, company provide LPG in 15kg & 33kg cylinders for domestic, commercial and industrial use throughout India as we have sufficient infrastructure to provide quality service to our customers. I have for sale 2 LPG Cylinder Manufacturing Units in HP. Capacity 65, 000 cylinders per month.in excellent condition with land and building. Rubber Crumb sheet used in places like LPG bottling plants where electrical discharge should not get accumulated. we are professional manufacturer of variLpg Bulk Installation Plantous . All of our products passed ISO9001:2008 .